The Krewe did a fantastic job of getting the hype started online with their daily posts and tweets leading up to GGV. From the first moment we landed in NOLA from Madison WI to attend our first Gooner Gras, we knew something special was on the horizon. 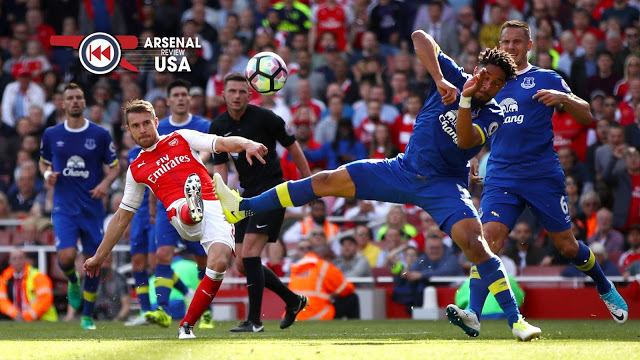 We had heard the tales of Gooner Gras’ past fondly retold by our Arsenal America family during the 2016 preseason tour in California and more recent trips to Austin and Chicago. Past attendees’ reminiscence definitely gave the mind’s eye an electric portrayal of the gathering, but nothing prepared the soul for all the smiles, hugs, high fives, and most impressively the LOVE from old and new friends coming from all across the country to gather and to celebrate The Arsenal. When I stumbled upon a sport that I hadn’t really followed before and fell in love with a team in red with the most bada$$ name I could think of, I had no idea what the future would hold for me. I had no idea how much this football club would come to mean to me. In the last 14 years, I’ve felt the highest highs and the lowest lows following The Arsenal over land and sea. 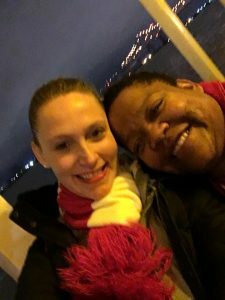 In the beginning, my journey was solitary and until I moved from North Carolina to New York, I did not have a real-life community to share my passion with, though I began to develop an online community on Twitter in early 2009 which has granted me many connections that I’ll be forever grateful for. Following last weekend’s trip to New Orleans for Gooner Gras V, I’m astonished at how full my life is because of this football club in the north of London and the family that they have provided me with. The last time I was in NOLA was for my birthday in 2014, and I went to Finn’s for the match that we won 4-1 overSunderland! It was also the same day that the Dennis Bergkamp statue was unveiled at the Emirates. I met Fredo after knowing him virtually from Twitter for a couple of years, and I met Omar and a few others that day as well. The Krewe of Arsenal was so welcoming even then, and I’m glad to see that their hospitality is still top, top, top, top quality. I was not able to make it last year, as I had 2 big trips lined up to eat up my vacation time and my funds, but I promised Fredo that I would attend this year’s soiree. And so I did. 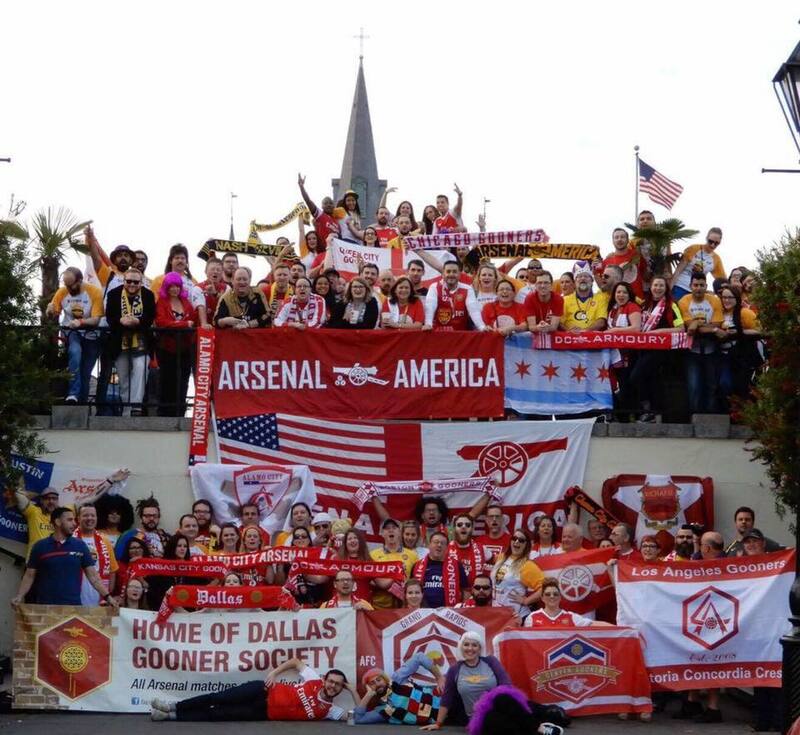 The Gooner Gals group has been so fantastic for me, and without giving away secrets of the Sisterhood of the Traveling Gooners, I can just say that it’s the only sorority of a sort that I’ve ever wanted to belong to. Tiffany Campo, you da real MVP!!! It was through this group that I found my roommate and partner in crime, Danita aka Momma Jup. 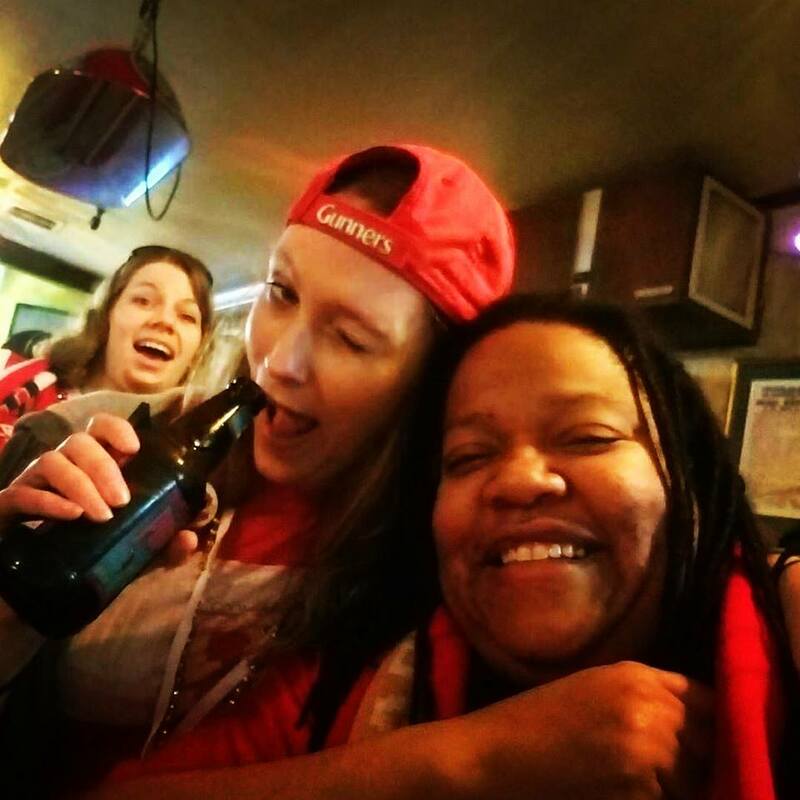 I was the sole gooner from Arsenal NYC attending, and she was likewise the only rep from Atlanta Gooners. 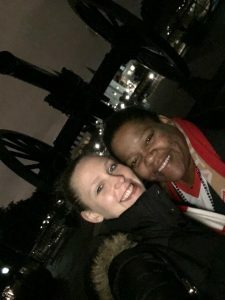 I can’t help but feel it may have been written in the stars to have one of the most amazing women I’ve ever met as my comrade for the weekend. I’m a bit more reserved by nature and not as apt to go up to people I don’t know and strike up a conversation, and most of the connections that I did make were through Momma Jup and her magnetic pull to everyone. From the time that we arrived on Thursday evening, we made an unspoken pact that we were in it together, and we were. 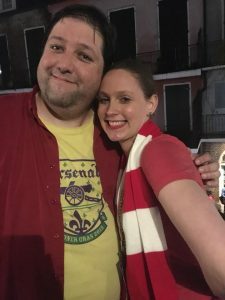 We showed up to Jackson Square and the cannon on Friday and ended up on Arsenal Fan TV with Robbie, which was unexpected, but also very cool. Thanks to Robbie, Troopz, and Tao for documenting this weekend as my memory is patchy at best even now. 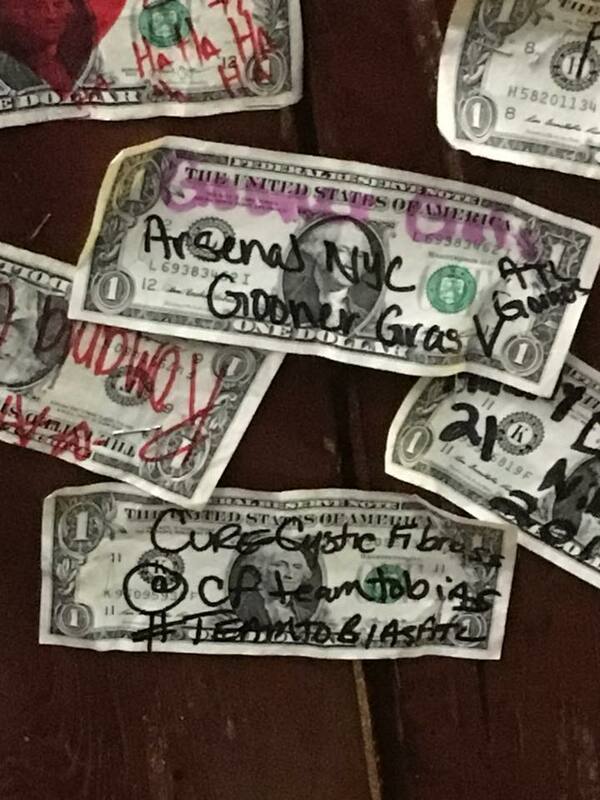 After that we scooted to my favorite watering hole, The Chart Room, and ended up drinking much of the day away while posting up dollar bills with special messages on them to commemorate our time there. From there we made our way to Bourbon Cowboy where Tao and Robbie took turns on the bull, and then we made our way to grab some food before the brewery on Friday night. It was a lot of fun to see the royal court named, and congrats to Boston George, Christine, Steve and Michael on your titles! Momma Jup and many others broke it down to the live brass band, I found myself still a little shy (I was cured of this the next day) and preferred to spend more time talking and watching, but really enjoyed the festivities. Krewe de Vieux parade and the live band and bar. We rocked the top floor and left no doubt that we take reveling to another level. While some others stepped out to other spots, a smaller group of us refused to let the party end there. The B.B. King All-Star band played a set just for us, with songs about Giroud (we’ll miss you, Oli) and Xhaka and quite a few Prince songs that kept everybody moving, with Boston George guesting on vocals and everyone backing them up. We may be a bunch of hooligans, but we’ve got rhythm and soul. Sunday was a chill day, and after Saturday, Momma Jup and I needed that. We joined up with Christina from Milwaukee and Erich from Chicago to visit Lafayette Cemetery No. 1 via the St. Charles trolley car. Slightly hungover and a bit sore, we ambled along with Arthur Smith from Save Our Cemeteries (they’re a non-profit tour group trying to preserve the cemeteries) and got a history lesson about New Orleans, not just about death, but about the lives that were led there since the city was founded 300 years ago. After that we made our way back to the Quarter for a late lunch and then it was time for the Paddleboat cruise, which was a great way to cap off an awesome weekend, while also cooling things down a bit. Afterwards, Momma Jup and I then made our way back to Jackson Square and Café du Monde for some beignets, hot chocolate and a last stop at the cannon. After that, we made our way back to the hotel and started packing up for our flights on Monday. Momma Jup had a 7:00a flight and though mine was later, I wanted to be ready to go in the morning for my later flight. When I left for the airport on Monday, I was exhausted and yet revitalized spiritually because my heart was full and because I let my real life trials and tribulations melt away for 4 days of fun with some of the coolest people I’ve ever had the pleasure of meeting. I’ve spent this week at work trying to recover and am only now getting my voice back, but it was worth every second of twisting, shouting, singing and drinking that I did during Gooner Gras V.
Thank you to the Krewe of Arsenal, the SwagCom, the staff at every venue that we rocked, the Gooner Gals especially (#YearoftheGal is truly upon us), and every Gooner that I met while I was there. Each and every one of you gave me something, even if it wasn’t a badge, or a sticker, or t-shirt, you gave me joy and laughter. See you all next year, and I’ll be ready to return the favor! COYG! Well here we are. One match into the new English Premier League season and stressed out already. Thankfully the points were secured and we can sleep soundly knowing Alexis Sanchez is staying put, for now. 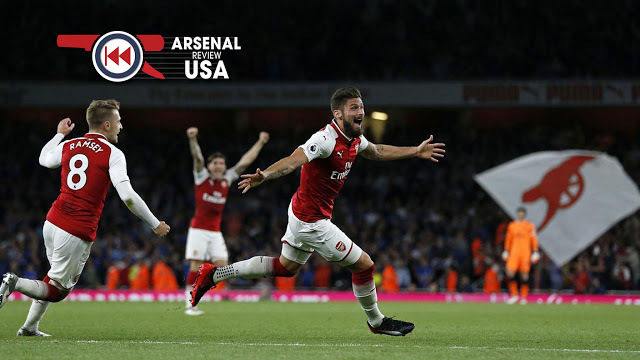 Media partner Arsenal Review USA has more, check out their latest posts below. Sure, it’s ten less than the number of FA cups that Arsenal’s won, but it’s a decent spread of download locations nonetheless: get the new pod from iTunes, our raw RSS feed or our archive. Hope your Thursdays are free: grab the new pod from iTunes, our raw RSS feed or our archive. 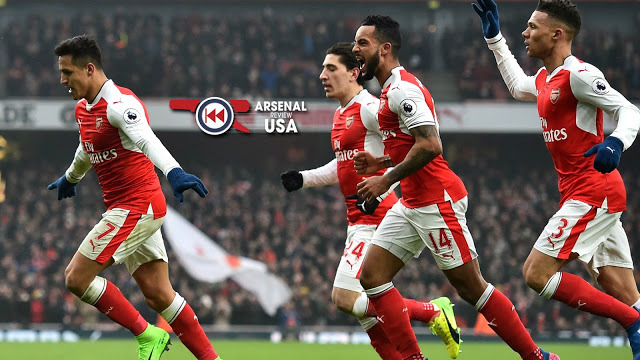 The FA Cup proves a welcome distraction to Arsene Wenger and Arsenal as the Gunners do just enough to ease Sutton United to the side en route to yet another FA Cup quarter-final, this time with help from Theo Walcott and Lucas Perez goals. 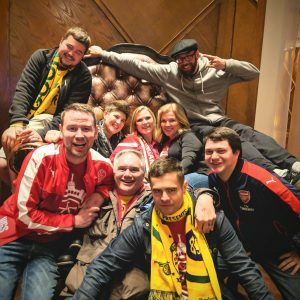 Joining us on the live show will be Jon Shay of Woolwich 1886 and Colin from the Krewe of Arsenal to talk Arsene Wenger’s point of no return and whether or not superstars like Alexis Sanchez are now in fact the real power holders at the club, plus reliving the highlights from Gooner Gras 2017…. The warm river air welcomed me as I exited the New Orleans airport terminal – a stark (and pleasant) contrast to the cold, biting wind the city prepared for us last year. But the weather, like last year – and all years – did not really matter much to a rather specific group of visitors. 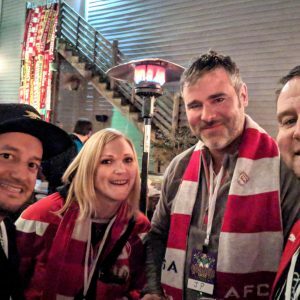 Gooner Gras 2017 was kicking off, and Arsenal supporters from 30+ U.S. cities, Canada, the UK, and even Hungary would have shown up even if the weather called for flaming hail and occasional volcanic eruptions. 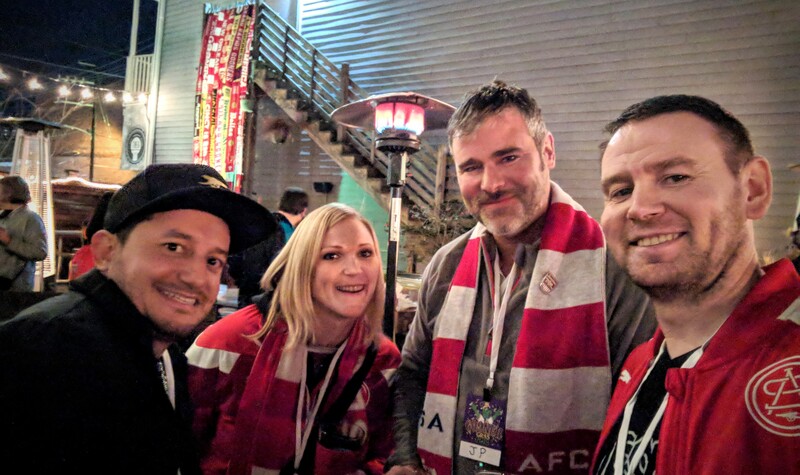 The (for the moment, at least) entirely unofficial kickoff to the annual New Orleans Mardi Gras season, Gooner Gras gives Arsenal supporters in the United States the chance to come together in large numbers to celebrate the passion, the love, and the obsession that is the Arsenal Football Club. 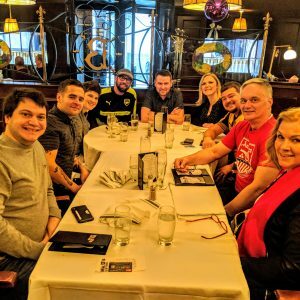 Now in its fourth year, what started out as just a few handfuls of Gunner supporters has exploded in popularity and growth with this year closing in on 200 participants. 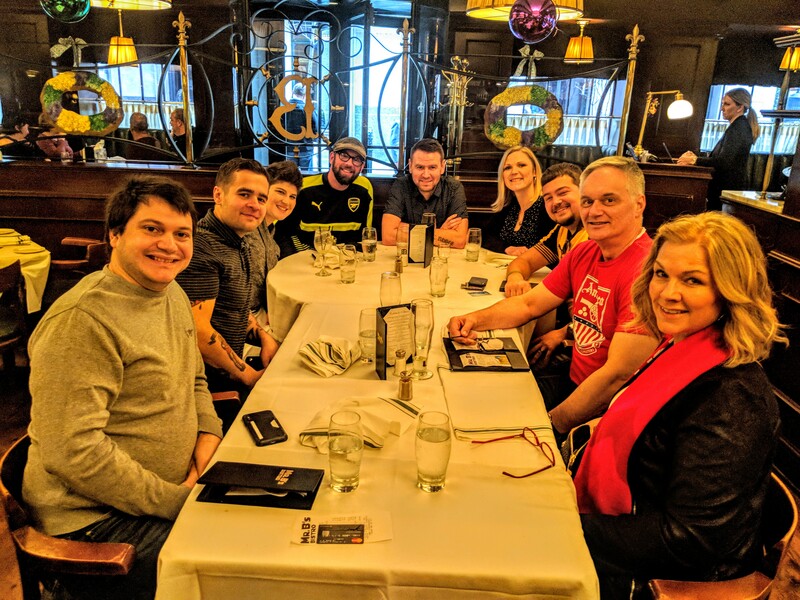 It’s the one chance a year where supporters clubs across the country that may only see 10 or fewer “regulars” each week in their pubs can get together with a triple-digit number of people who understand their dedication to an iconic English Premier League team. 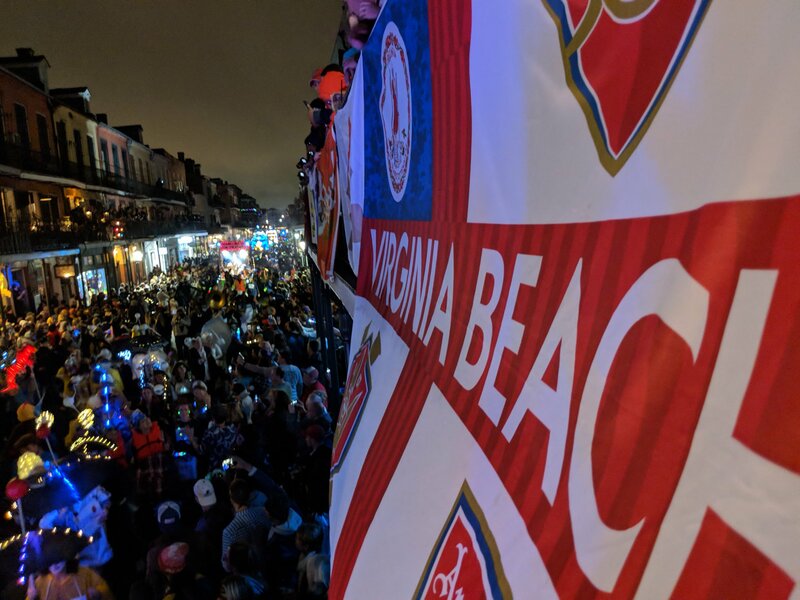 Four years in and the tireless Krewe of Arsenal has put together a standard, well-organized series of events for Gooners to enjoy during their time in New Orleans. And the plan has to be organized, because hundreds of Gooners are the variable in any situation. The “Herding cats” cliché is only valid in this situation if the cats have been drinking, won’t stop singing, and hug you every time you try and direct them to the proper location. Some of them can’t tell time better than cats, either. Regardless, a short time later I found myself at a hotel in the French Quarter with most of a lovely Friday afternoon still ahead. Some of my San Antonio brethren from Alamo City Arsenal had arrived before me and their social media updates only made time move more slowly during my travels. But I knew where they were and with my Arsenal jacket and scarf traded for a simple vintage AFC t-shirt, I wandered into the humid street and found a dozen Gooners at a bar on Bourbon Street which ACA had commandeered the year before. But now Denver, Raleigh, Austin, the UK and others were also represented in the crowd and the happy chant of, “Gooner!” roared out as I approached. We all do it every time someone with the crest approaches. The feeling of friendship and warmth it generates when given and received simply does not get old. What does get old, it seems, is to have the Arsenal crowd expand to over 25 noisy souls all trying to drink in your drinking establishment. Gooner Gras activities begin on Thursday, but the majority of Gooners pour into the streets of the Quarter on Friday. And the bartender’s scowl only grew as more money poured into the tills. Most of us found this confusing. So a chant started and we moved down the street. We didn’t mind leaving, as it was almost time to attend the first “big” event of the weekend – the Gooner Gras Happy Hour welcome party at the upstairs bar of a local restaurant. I never caught an accurate figure, but upwards of 60 or more Gooners filled the bar and – I’m pretty sure – terrified the manager. But we Gooners can be sensible (yes, really!) at times, and most of us recognized this was not the place for chants and other verbal offenses. However, the manager remained unconvinced and at one point closed a curtain between us and other customers. No one cared, as this was the first chance most of were having to say hello to friends from past Gooner Gras weekends and welcome all the newcomers to the festivities. And of course, we knew the time for raucous, outrageous singing and chanting would soon arrive … in the form of a school bus, of course. When the traditional yellow and black school bus pulled up, Gooners systematically closed their tabs and wandered down the stairs like a bunch of grinning, half-bombed lemmings. No one asked any questions – we all just got on the bus, sat down, and waited. The loud and impressively offensive chants started only after the driver had pulled at least two or three feet away from the restaurant. We covered all the mandatory topics, scum teams, plastic teams, traitors of the AFC, and so much more. And we didn’t stop until the bus did – in front of the NOLA Brewing Tap Room. We tipped our driver and walked into the Tap Room. 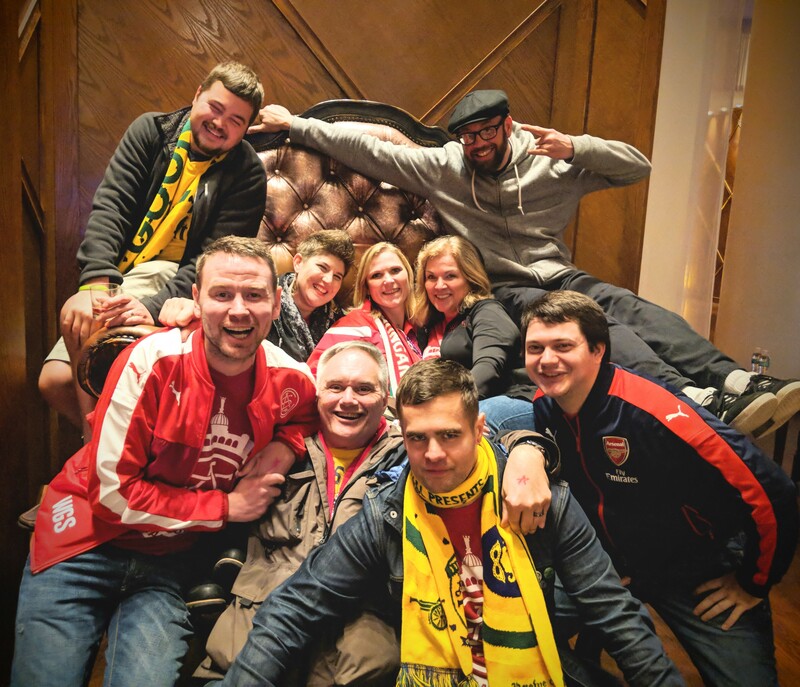 We moved straight past the bar and into the back room which would be Gooner Gras central for the best meet and greet of the weekend, a great charity raffle, and – of course – the coronation of the new king and queen of Gooner Gras. In what must have been the most peaceful transition of power in recent history, the 2016 King and Queen of Gooner Gras relinquished their crowns with a few tears shed, but no bloodshed. Beer and laughter flowed freely as the kingdom’s loyal subjects awaited the announcement of their new leaders. The names were announced, and the new king and queen stepped forward to greet the masses. The king gave the crowd a stately wave and commanded us to drink to the Arsenal. We did as instructed and agreed that the king’s wisdom could not be argued. The queen stepped forward and said some kind words to her subjects. Then she asked what we thought of the small peasant village outside our grand kingdom called Tottenham. We told her our thoughts with great eagerness. Then she thanked us. We said that was all right. With the formalities concluded, we reached for our wallets and focused our attention on the charity raffle, where we gave up lots of money for the chance to feed our insatiable desire to add yet one more Arsenal item to our collections. Some of us won big, but as usual, the charity won biggest. And Gooners like it that way. With arms full of prizes and bellies full of beer, the boisterous throng made their way to the exits. Some left in search of new watering holes, others had their collective minds on the 6:30 a.m. local start time for the morning’s match against Hull, and headed for their hotels for a few hours of rest. The night darkened and a cool breeze sent us onward. Regardless of our evening destinations, the morning would come soon. 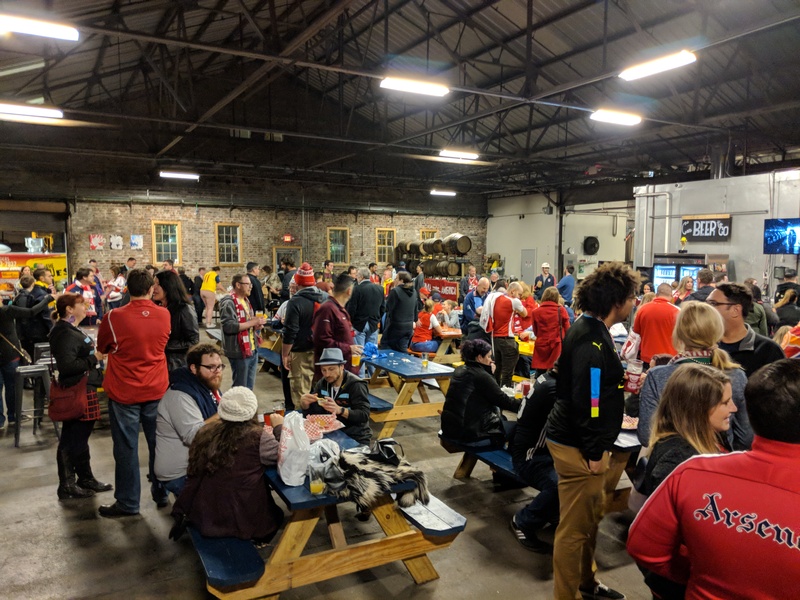 Finn McCool’s plays host to the Krewe of Arsenal’s weekly matches, and kindly agreed to bring in what can only be described – lovingly – as a Gooner Sunrise. 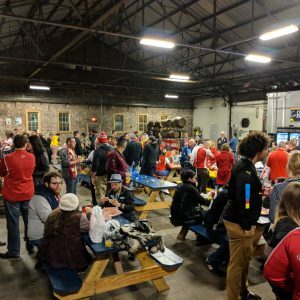 A sea of red and white-clad Gooners in various states of disrepair stumbled into McCool’s and brightened its muted atmosphere with a quiet buzz of excitement and anticipation. Pre-match coverage lit up the television screens around the pub. Someone brought doughnuts. Beer, bloody marys, and other assorted drinks quickly balanced out the bloodstreams and the Gooners cheered the kickoff with an exuberance rarely heard from any of us at that hour of the morning. 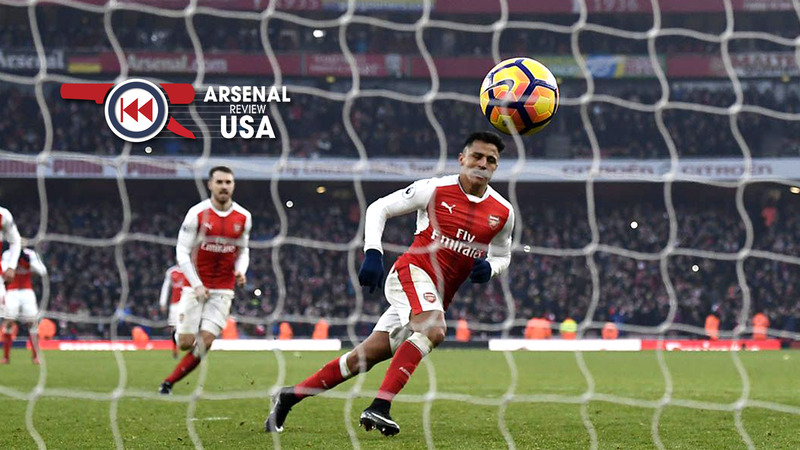 Chants and songs remained consistent with high participation and energy – an energy that finally paid off with an Alexis Sanchez goal which generated roars as it went in, and laughter upon replay review. Nevertheless, the 1 – nill to the Arsenal chant began in earnest and hugs, fist bumps, and high fives became the order of the day after Sanchez finished Hull off with a penalty kick. 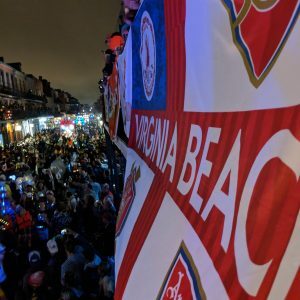 At the whistle, Gooners poured out onto the Finn McCool’s patio, took an amazing picture together, and then gave both the city’s Tottenham fans a very proper taunting. With the match secured and the scum put in their place, thoughts turned to breakfast, more booze, and whether to watch the Liverpool match. And naps. Many people thought of naps. The day had started early and would go on well into the night. I went to the hotel, slept through the Liverpool match, and had a dream about Diego Costa being eaten by a giant koala bear. Waking up to see the score line of 2 – 0 Liverpool got me going quickly. I changed and headed for a bar where numerous Gooners were way ahead of me in the drinking and laughing at Tottenham game. There would be time to catch up later. At that moment, we needed to make our way to Washington Artillery Park at the outer edge of the Quarter for a picture with the very large cannon that sits on a raised platform in the the square and looks out onto the sprawling Mississippi river. As in previous years, the impressive mob of Arsenal supporters in matching and / or similar attire making their way past the Farmer’s Market and the St. Louis Cathedral in song garnered some attention from tourists, who couldn’t help but snap a picture or two – even if they weren’t sure what they were looking at. And – as in years past – this incredible group managed to behave and be still long enough to capture the energy and excitement of the weekend in a single snapshot. When everyone had climbed down from the cannon and the square itself, we made our way to Dat Dog NOLA, the restaurant and bar that would once again host us for the first parade of the Mardi Gras season. Okay, he didn’t say that. I put the beads on him and he left without a word. I may have been drinking and as Saturday night turned into Sunday morning, I may have shouted that I put Arsenal beads on Seth Rogen to every Gooner who attended. And that was probably a tad over the top. Who cares, anyway? He’ll never start for Arsenal. I’m over it. Sunday opened quietly with a small crowd of us watching Burnley draw with Chelsea at a bar roughly 8 feet from the hotel – the limit of what I was willing to call walking distance at that point. When the match ended we tallied up the weekend: Arsenal win, scum loss, Chelsea draw. A better set of results we could not have legitimately asked for. Gooner Gras would end on a high note, for sure. But it would end with fewer supporters, as planes and cars were already taking happy, weary Gooners home. Many missed the races at the New Orleans Fairgrounds, and others (thankfully) missed a lot of us trying to ride a mechanical bull. Yep, with extremely limited exception, it was not any of our finest moments. But even the worst rider (me) got off the ground to the cheers of other Gooners around me. Because when you’re Arsenal someone has your back no matter what dumb thing you’re falling off of. Sunday afternoon moved away much like Saturday and when evening took over, a multitude of cheerful and noisy Gooners made their way to bars with bands and bars with balconies and as we roamed the crowded streets we stood under the neon lights and let the whole of the French Quarter know who was – by far – the greatest team the world has ever seen. Hours of laughter and singing ran together until, as I sat on the back patio of a bar with 30 or so Gooners, my brain forced me to do a little math and make a rather sobering calculation: I was leaving in less than 8 hours. I had to pack, had to sleep (a little), which meant I had to go back to the hotel. My Gooner Gras was ending. No, it was over. I stood up and shouted to my Gooner family. I smiled and I said, “I have to go.” I hugged David Ziegler (one of the ACA founders and the person who introduced me to Arsenal), and tried to say a few quick goodbyes. But then I looked at everyone and made a heart with my hands, like Giroud does. Because I couldn’t have said another word out loud. No one enjoys saying goodbye at the end of something special. But its Gooner Gras’ temporary nature that – like many things – makes it so special. Well, it’s part of what makes it so special, anyway. 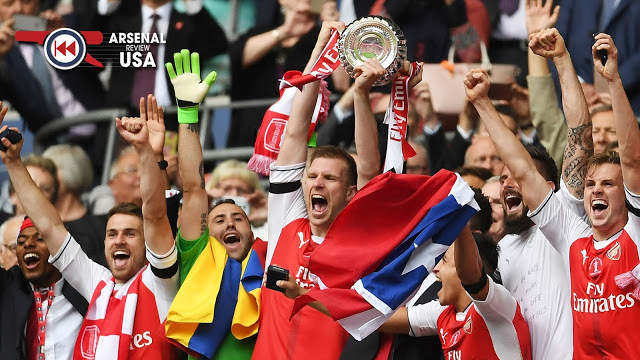 What – for me – makes it such a monumentally incredible event is its ability to reinforce a very simple yet important ideal – just how powerful a common ground the love for Arsenal is. The love for this team creates an unbreakable bond among people from every walk of life, every nationality, and every religious background. There are always exceptions, of course, but this club draws to its center an optimistic, triumphant core of people who are bound to this club through thick and thin. We all love trophies, and we all love winning. But when you’re surrounded by fellow Gooners and you’re singing, and shouting, and cheering with so many pleasant, affable, and wonderful people, you start to understand how special this is. You start to realize that when you’re an Arsenal supporter, you’re always winning. We celebrate Arsenal’s highs and lament their lows with an absurdly diverse group of people hurled together by a common passion that binds us for life. I support the greatest club in the world, and I do so alongside the greatest supporters in the world. Gooner Gras celebrates this. It’s infectious, it’s hilarious, and it’s growing. And you can see for yourself next year. Clock is ticking. Oh, and did I mention I put Arsenal beads on Seth Rogen? Score the new podcast with your hands (and ears) by grabbing it from iTunes, our raw RSS feed or the archive. Panenka the new podcast onto your device of choice by grabbing it from iTunes, our raw RSS feed or the archive.